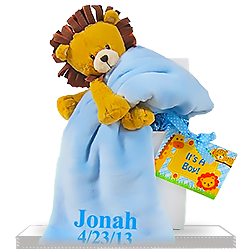 Baby lamkins will be your new boy's favorite naptime pal--even the satin edgings of this plush toy are blue. 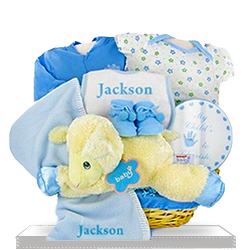 This gift set is all boy, right down to the personalized fleece blanket and blue and white bib. Also included is a masculine cotton bodysuit and a sleeper. 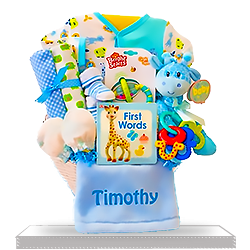 Adorable booties just for boys are there as well as a blue and white tin that features a baby handprint design. 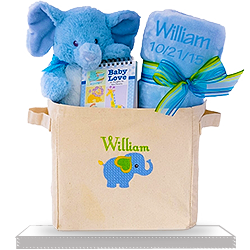 The reusable basket is lined with blue fabric for use in baby's room. 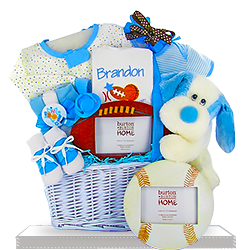 This is the first time I have placed an order with Giftbaskets4baby. 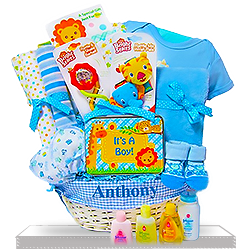 I looked at other companies, however, I found giftbaskets4baby to have the best value for the money. 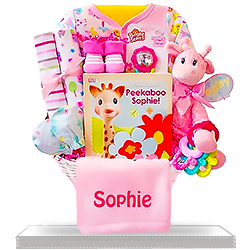 This was the first time I used giftbaskets4baby and they delivered as promised. Very happy with my purchase. The recipient said it was presented beautifully. Given as a gift. Products were great quality and packaging was very nicely done. They were very happy and excited when it arrived. Good combination. Thank you for quality products and wonderful service! We will definitely order again and again. Always the highest quality things and impeccable service. I will be doing business with these people again. 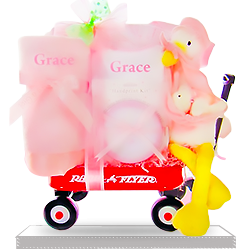 delivered on time and great gift for the money. customer service is very helpful. excellent to deal with. Everything was on the highest level but I hoped it would be bigger. Sent this to my new grandnephew oversea. Niece told it was delivered promptly and wrapped magically nice. She loved it, thank you. Nice gift! Not too expensive and just right size for a baby.